In 2016, Andres Oswill and five other PSU Masters in Urban and Regional Planning students embarked on a capstone project in partnership with the St. Johns Center for Opportunity (SJCO) to build a comprehensive housing plan for the St. Johns community. 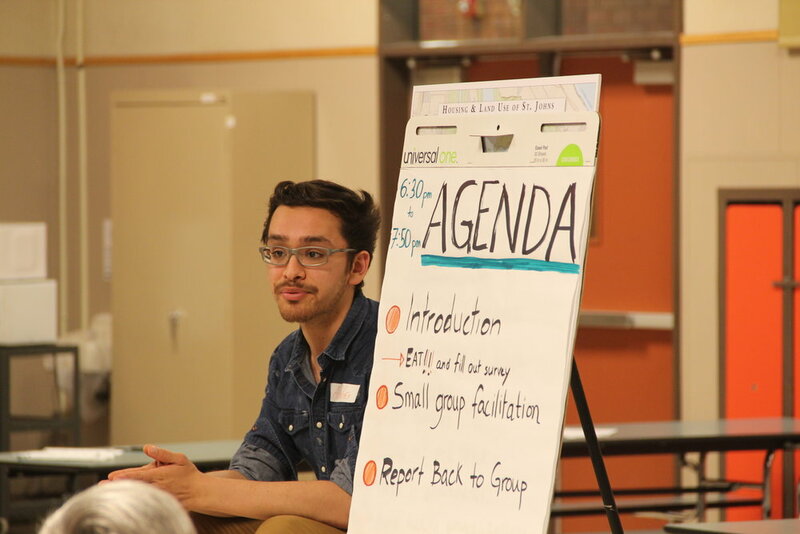 Over a period of one year, PSU and SJCO engaged community members in dialogue around housing issues and an examination of Oregon housing policy to create the St. Johns Housing Action Plan. This plan is being implemented by the Housing Committee, comprised of a group of community members and the St. Johns Center for Opportunity. Andres now works in Tenant Policy for the Portland Housing Bureau. We sat down with Andres to talk about the impact of his work with SJCO during this project. Andres explained that the research project was really rewarding because he got to know the people and the neighborhood very closely. “My involvement with SJCO and this project was without a doubt the most significant and impactful involvement of my Master’s Program. I was able to take a theoretical program and put it to use in a neighborhood who needed me. That meant a lot to me! We envisioned and created a neighborhood plan, which is very different from the traditional housing plans that exist at a regional level. It was important to be able to create something to help address issues and create a new model to contribute to the field of urban planning”. The students and SJCO felt really strongly about engagement with the community during the project. To capture the voices and concerns of community members, they held 5 different listening and engagement events in the area. George Middle School and the St. Johns Neighborhood Association hosted the listening sessions in the community. In these listening sessions, the students heard that the community was ready to do something. There was concern about new construction, the history of only building single-family homes in the area and the students found themselves surprised to find the housing pressure really affecting the community. People were concerned with themselves or their neighbors moving and selling, the increase in rents, eviction and displacement, and the changing profile of the neighborhood from working class to the “next frontier of Portlandness”. They were asking, “What can we do? How can we keep people in their homes?” Unlike other neighborhoods, it has many multigenerational, long-term residents. Andres recalls talking to a community member who had lived there for 10-15 years and she said “that’s nothing around here. In the context of St. Johns, that’s a really short time”. They had the additional challenge of working within this historical context. What did you learn from working on the St. Johns Housing Action Plan project? “It was a real look at the housing crisis in Portland. I got a rich background of knowledge for myself to say this is what it looks like: many empty lots built up with high cost apartments, older apartments being gutted and revamped to become high end, people leaving the neighborhood. I got a good definition of what housing stability looks like too. Housing stability looks like being able to live in and stay in the neighborhood that they grew up in”. Now, Andres is working at the city level writing landlord and tenant policy. He explains that this project informed his current work and he knows that the city needs to keep grounding policy recommendations in neighborhood conversations like they did in St. Johns. How do you see SJCO’s work impacting the St. Johns community? Interested in learning more about the St. Johns Housing Action Plan recommendations and findings? You can visit the St. Johns Center for Opportunity (8250 N. Lombard St.) to read a copy of the 82 page document or check out more info on our website here.